Eva Merrell provided clutch legs on both of the Aquazots’ relays last night in College Station. Watch all the meet records from Day One of the 2016 U.S. Winter Junior Championships-West in College Station, Texas. Watch all the races from Day 2 finals at Junior Pan Pacific Swimming Championships in Maui. In the men’s 100 free, Australia’s Jack Cartwright raced to the top seed for finals with the only sub-49 swim of the morning. Cartwright posted a 48.91 to drop over half a second from his seed time. Bayley Stewart, Zoe Bartel, Coleen Gillilan, and Kylee Alons of Fort Collins Area Swim Team went 4:08.39 to break both the Speedo Juniors meet record and the NAG record for 15-16 girls in the 400 medley relay on Friday. 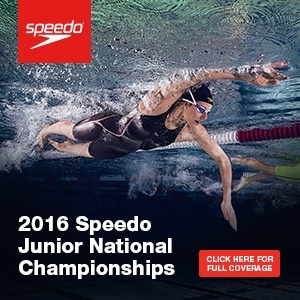 Drew Kibler of Carmel Swim Club led the qualifiers in the 200 free on Day 4 of 2016 Speedo Junior Nationals in Minneapolis. Taylor Ault of La Mirada Armada won the women’s 800 free on the first night of finals at 2016 Speedo U.S. Junior Nationals.